To be honest. I’m not read this book yet. I dunno why, I skip it and then read Homo Deus. But, from the excerpt which I read. It is about a long history of the humankind. And probably, the reason why I’m not in an appettite to read it is simply because Sapiens mostly talk about the past. While in the other hand Homo Deus and 21 Lessons… speak about a future. Which is a topic that tempting me the most. So, maybe I’ll write a review for Sapiens later. I underline one idea that Harari describes in this book: human extinction. That mass extinction is a natural matter and is a natural way of maintaining balance. Harari noted cases of mass extinction which caused the destruction of several species – more specifically – that occurred in mammals. Mass extinctions occur in various forms and various causes: natural disasters, asteroids, virus, bacterial attacks, etc. Harari writes that throughout human civilization, there are 3 things that contribute to reducing the number of living people: starvation (see the fate of Africa), war (world war 1 and 2), and disease (black plague, ebola). the mass extinctions that will befall humanity in the future are machines. Dataism. Humans in this century have used dataism in every line of life. Algorithms are weapons and big data are treasures that are nurtured to grow and then harvest. 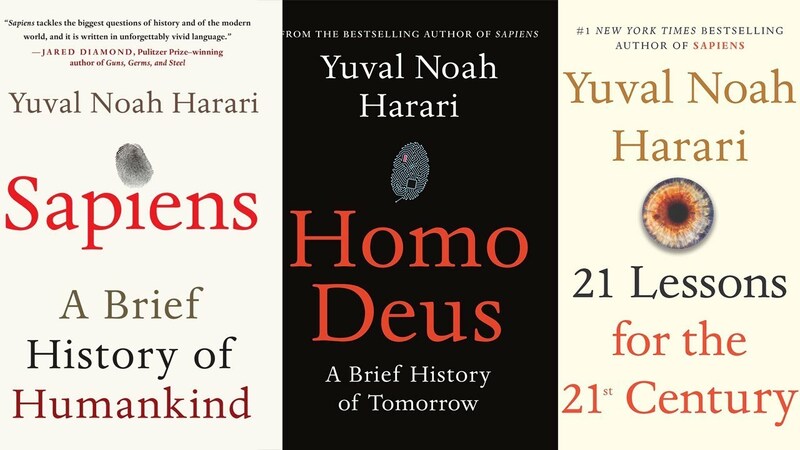 In Harari’s view, in the not too distant future, there will be artificial intelligence using big data, they will become more intelligent, stronger, more powerful than flesh-based blood species and proteins called homo sapiens. Will arrive when predictions about Skynet or The Matrix come true. It cannot be denied, in this day and age machines know more about humans than humans themselves. The easiest example: Spotify and its algorithms are smartly able to curate and compose music playlists that are most appropriate for each listener. Automation takes place in factories replacing human energy that has been exhausted after working 8 hours. Donald Trump’s victory is assisted by data collection machines. This book is actually Yuval Noah Harari’s second book. The first is titled Sapiens: A Brief History of Humankind. However, I chose to read Homo Deus first out of curiosity: what will happen in the future of humanity? At present the human population has reached 7 billion more, in 2020 it is estimated that the number of people will be at 9 billion. This small blue planet obviously will not be able to support and be as much a human’s livelihood. When the statistics have spoken that way, who can guarantee that tomorrow humans will not return to war to get rid of hunger and invasion of bacteria? This book is suitable to be read by those who are pessimistic about the future, admiring the ability of the Spotify algorithm, consider Thanos’s idea in the Avengers: Infinity Wars regarding the destruction of half of its population by half the other population is right, and Maltusians. Thought-provoking, mind blowing, scarier than Homo Deus. Harari predict the future: not so far future when the human life must be shifted from the top to the bottom. The advance technology will change everything: the rise of an AI, the big data, the clever algorithm, and how it will make an automation on every jobs: from the factory, to the office, even in the specific art field such a musician. The new class will emerge: the useless class. The new buorgeois, the wealthiest caste that could control everything. And so on and so on. It is really sounds like an Orwellian Dystopian world, Or Huxley’s Brand New World came true. As Morpheus said in The Matrix: welcome to the desert of the real. Harari outlines comprehensively how AI (Artificial Intelligence), big data, and algorithm devices will become a new revolution of human civilization: automation on all fronts, which automatically removes some humans as workers, the working class (proletariat) will disappear, new classes emerge which he call “useless class”. This will nudge all work, including art. Harari, describes how humans in the centuries have considered art [music] to be a powerful entity, because music is able to explore, then describe the emotions, feelings, thoughts of humans. Music is concluded as a very precious and sacred human product. In fact, when AI was born, it turned out they were able to take over the work of composing this music. Logically, music is mathematics, algorithmic calculations. So, AI is easily able to take over this job.